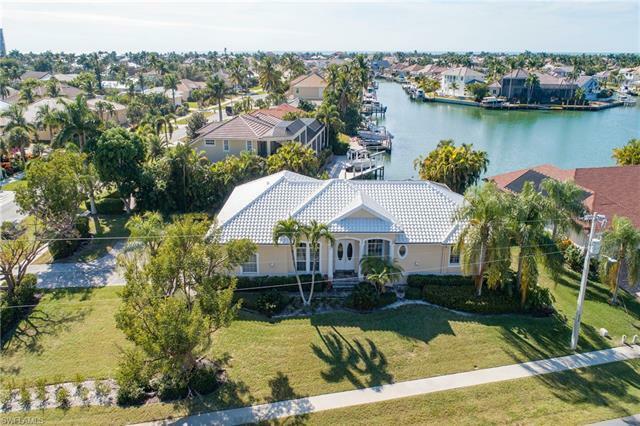 This long water viewed home on a large lot, in the coveted Tigertail section of Marco Island, is the property you have been waiting for. The home has an extensive rental history averaging over $60, 000 per year with $58, 000 already booked for 2019! The den has been converted to a 4th bedroom to maximize the rental potential. The original owners have been meticulous with maintaining the property and have done multiple enhancements including a travertine pool deck, new roof and pool heater in 2018 along with fresh paint. The floor-plan is sprawling and when all of the sliders are open, the inside and outside living areas blend together to create an optimal entertaining experience. The kitchen was remodeled 5 years ago and the space is remarkable. Naturally, granite counter-tops and stainless appliances round out the package. There is a formal dining area, or you can dine al fresco as the lanai has a large covered space. Of particular note, is the fact that this home is located within walking distance to Tigertail Beach access. The SouthWest view from the rear of the home is long, captivating, and preferred. Please click on the VT icon to see the photos as they speak for themselves.